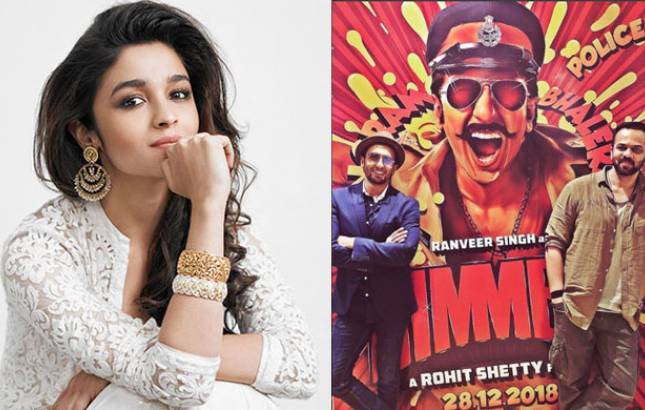 Alia Bhatt NOT to be a part of Ranveer Singh's Simmba? Ranveer Singh has lately begun shooting for Rohit Shetty directorial Simmba and the actor is quite ecstatic about portraying the role of a super cop in the movie. Ranveer Singh's upcoming movie Simmba has been one of the most talked about movies. The Bollywood actor has lately begun shooting for this Rohit Shetty directorial and the actor is quite ecstatic about portraying the role of a super cop in the movie. While the movie has hit the floors, there have been speculations about the lead actress of Simmba. There have been reports that Alia Bhatt is being considered to play the lead role in the movie. However, as per a report published in DNA, the Highway actress is likely to lose Simmba because of Rohit Shetty. Apparently, Rohit wanted to cast Alia in Golmaal Again. But the actress reportedly asked the director for ‘time to think it over’, which eventually miffed Shetty and he chose Parineeti as the lead. And looks like, Rohit is still miffed with the young actress and is reportedly not in a mood to cast her opposte Ranveer. On the other hand, Simmba happend to be Karan Johar's co-production and he is planning to be the peacemaker between Rohit and Alia. We wonder if Rohit will end up roping in Alia Bhatt as Simmba's lead actress or we will see a fresh pair in this Rohit Shetty directorial. On a related note, Ranveer Singh and Alia Bhatt will soon be sharing the screen space in Zoya Akhtar’s Gully Boy.